Susan, one of 6 children and the only one with PKU in her family, aspires to become a social worker and now attends the University of Wisconsin Baraboo/Sauk County, where she hopes to obtain an Associate’s Degree and transfer to The University of Wisconsin Madison to receive a Bachelor’s Degree and hopefully a Master’s Degree in social work as well. She is passionate about helping others and is especially tuned to the needs of victims of human trafficking, which she has learned about from watching documentary films. An excellent student, taking many advanced placement courses in high school, Susan was involved in many extracurricular activities and clubs as well. 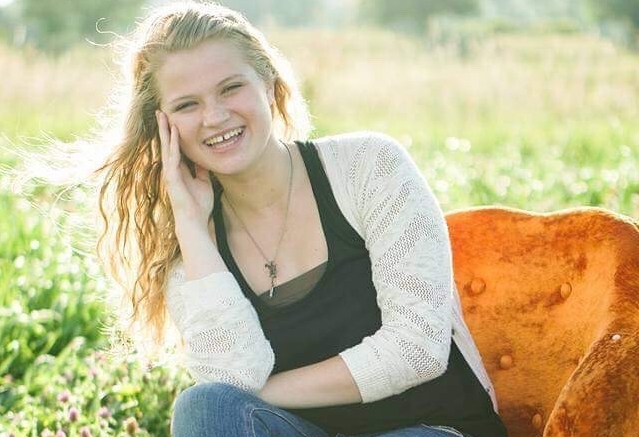 She was an active member of the school newspaper, student government, a vocal jazz group (through which she went to State Solo Ensemble to compete), the National Honor Society, and was a cheerleader for 4 years. During junior year she was student council president and selected to be Prom Queen by her peers. She educated middle and high school students about domestic abuse and also attended a conference about dating violence, and her involvement in the Refuse to Bruise club allowed her to explore her interest in human trafficking prevention and domestic abuse. During her first year of college, Susan volunteered with the school volleyball and basketball games and was a volunteer for the Healthy Habits program (teaching children about healthy eating habits and how to prepare simple snacks for after school) and a local Habitat for Humanity store. She has worked for 4 years at a local pharmacy and when younger worked for a family business. She says, “There are always a million reasons not to do something, but having PKU has never been one of those reasons for me. There have been many challenges in my life, but I never let this disorder stop me from achieving my goals. I think of myself as a positive person and having a positive outlook on my PKU has shaped me and how I perceive other situations. My parents raised me to believe that PKU doesn’t define me as a person but rather is just something that I happen to have. I always look at the glass as being ‘half full’ instead of “half empty” especially when it comes to my PKU.” She maintains very low blood levels (2-3 mg% is typical) with a low tolerance for phe and says about her diet, “I have never had a problem managing my PKU diet because I know that it is something I have to do to maintain a healthy lifestyle. I eat mostly fruits and vegetables and usually do not order low protein foods due to the expense (and they are not always convenient for me to use).” Susan has attended Camp PHEnomenal for the past 4 years and cherishes her many friendships.